You can see a larger version here, but it's so poorly written that I wanted to break it down into sections for easier analysis. Sounds like a warning, doesn't it? "Targeting" is usually associated with fraudulent crime when not used in a marketing sense (which, some may argue, is the same thing). So should I be concerned about impending victimhood? 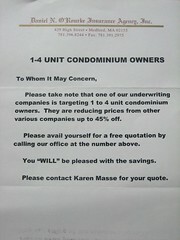 Perhaps not; it appears the nameless underwriting company is reducing prices. Or is reducing the prices of other (various) companies. I wonder whether they know about this? And it's not clear which prices are reduced. Or reduced off. One assumes it's house insurance, but it could be anything, given the apparent variety of other companies involved. I always thought it was "avail oneself of" something. At least, that's what the dictionary says. Few things are more irksome than the misuse of highfalutin' phraseology. And this isn't great from a usability standpoint, either; they're making the reader (the customer) do the work of finding the number himself. Not as much of a gaffe on a printed letter as it would be online, where the trigger finger is always ready to click away if things become complicated, but the problem is the same. The reader has to look for the number (written in a much smaller type size) at the top of the page. Would it have been so hard to repeat it in the sentence? Or to include the contact name here, instead of two lines later? But perhaps everything will be okay. They kinda sorta guarantee it. Maybe. Would have been a great pun if they were offering legal help with inheritance distribution. But they're not. So it's either an attempt at sarcasm or a not-so-subtle Sopranosesque threat. And then, to close: nothing. No "Thank you for your time," no "With best wishes"--not even a "Yours, etc." It's a letter from no-one, pulled from the printer and whacked into an envelope with as little effort as possible. Three out of four paragraphs start with the same word--"please"--but that's as close as this company comes to trying to make nice with their prospective client. On the positive side, at least there are no typos.